Back in another motel I've had some time to work on the main battery. Since I don't have plans and only suspect source material I had to make things fit, mainly by making cardboard cut outs to check for size. The look demanded big, cartoony guns, and I should have made the hull a little beamier to fit them. After the hull was built a found a contemporary reference that said the ship was "almost square", but that is not really reflected in the pictures I am working from. Too late to change now! I was hoping to make the wheels from wood and did make some good rims by wrapping veneer around a mandrel. Drilling for the spokes I finally decided needed more equipment (or time) I did not have or was willing to spend, so I found some O gauge baggage cart wheels from Wiseman Model Services that would work well. 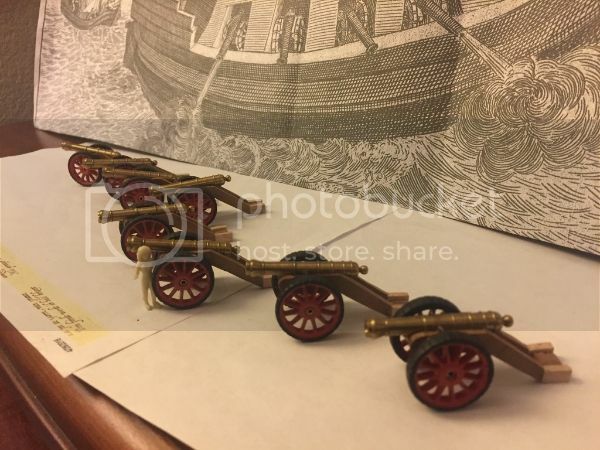 The cannon are based on those pictured on the print of the Fin, with details coming from slightly later English Civil War guns, mainly those at the fort in Londonderry. Most of those details have yet to be added, and at this scale I'm just going to use black paper for the ironwork. With the guns together I can now start laying out the casement. Other hull work is progressing- I just don't have pictures handy.